Critics’ Choice Awards are considered a “strong bellwether” for the Oscars. “Crazy Rich Asians” won a Critics’ Choice Award for Best Comedy Sunday in what could be the first step in a successful movie award season. The award was a win for representation, producer Nina Jacobson, who spoke on behalf of the film, said in her acceptance speech. “When I was coming up in the business, my bosses — white guys — told me that while every audience member can identify with a white male protagonist, white dudes can’t be counted on to identify with anyone who doesn’t look or live like they do,” Jacobson said on stage with members of the film’s cast and crew behind her. Sunday’s award comes less than a week after the cast was honored by the National Board of Review. “Crazy Rich Asians,” the first major Hollywood studio film to feature an all-Asian cast in a quarter century, has been hailed as a major step for representation and is credited with increasing Hollywood development interest in projects featuring Asian-American stories. It has grossed more than $200 million worldwide, making it the most successful romantic-comedy since 2005’s “Hitch,” according to Box Office Mojo. A sequel is currently in the works. The Critics’ Choice Awards are considered a “strong bellwether” for the Oscars, according to Variety, in part because the Broadcast Film Critics Association, which puts on the awards, is one of the largest groups to vote on movie superlatives. Oscar nominations are expected to be announced Jan. 22. “Crazy Rich Asians” was nominated for a Golden Globe for Best Motion Picture — Musical or Comedy but lost out to “Green Book” at the awards ceremony this month. Constance Wu was also nominated for a Golden Globe and a Critics’ Choice Award for her performance as Rachel Chu. “Crazy Rich Asians” is currently up for awards at the Producers Guild of America Awards and Screen Actors Guild Awards. Both ceremonies are scheduled to take place later this month. 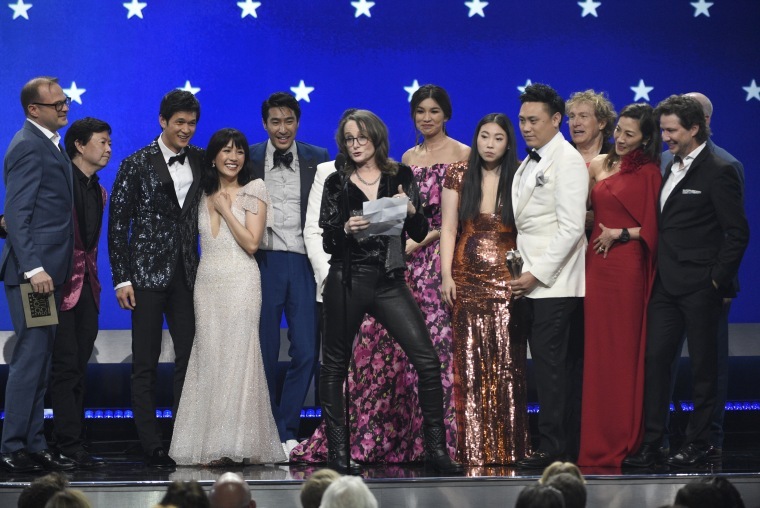 On the TV side, the Critics’ Choice Awards also featured wins for people of Asian descent. Sandra Oh won for Best Actress in a Drama Series for her performance on “Killing Eve,” and Darren Criss won Best Actor in a Limited Series or Movie Made for Television for his performance in “The Assassination of Gianni Versace: American Crime Story.” The limited series also picked up an award for Best Limited Series. This entry was posted on Tuesday, January 15th, 2019 at 8:39 PM and is filed under Culture, ISSUES, NEWS, Uncategorized.